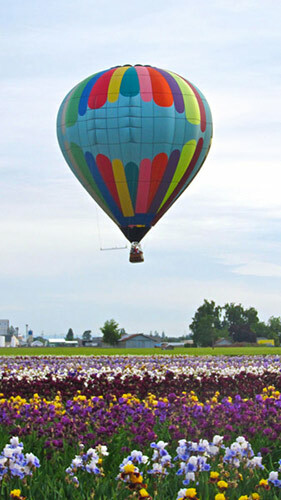 In the heart of the Willamette Valley we cultivate 200 acres of top-quality, beautiful Iris. Our dedication to breeding and growing the finest Iris in the world began in 1925 in Minnesota by our grandfather F.X. Schreiner. He turned a gardening hobby into a passion, and a passion into a legacy. Since that time, with years of love and dedication from the entire family, our business has grown significantly, and today Oregon is the largest grower of Iris in the United States. Coming upon four generations, we are family owned and operated; hybridizing, growing and distributing thousands of Iris annually. We monitor our growing fields throughout the season to ensure you receive top quality stock that is winter hardy, disease-resistant and pest-free. Each rhizome is hand-dug fresh from our fields in Oregon's Willamette Valley and individually hand-packed for safe shipping. You will receive A-1 size rhizomes in first class condition, ready to plant. We guarantee your satisfaction! Join the thousands of satisfied Iris lovers who have watched their gardens burst into bloom with Iris from Schreiner's Iris Gardens. In early May each year, we open our 10-acre display gardens to the public. 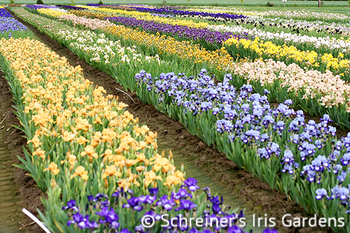 Make a tour of Schreiner's Iris Gardens one of your springtime traditions. During bloom season, our display gardens are open from 9:00 a.m. to 6:00 p.m., rain or shine. Parking $5/car.